We're not talking about the increase in crop production here but nonetheless, for someone who steers clear of green clothing articles, it IS pretty revolutionary when I ended up coming home with one. Most green hues make me look like a human version of pak choy, not the kind of appearance I want to project. Never say never. I bought myself a green Zadig & Voltaire cardigan last week at a fraction of its original price at their outlet store in Chelsea. The muted green with a blue undertone is surprisingly flattering against my skintone. Little L gave me a thumbs up inside the fitting room along with the most effusive compliment. So that's a yes and a packet of sweeties for her. Yes, I'm easily bribed when my vanity is at stake. Now that the temperature is hitting about 20 degrees Celcius, I no longer need to swathe myself in layers of clothes. After seeing grey skies for the better part of the year, any hint of sunlight makes me want to douse myself in more colorful clothes. I had fun pairing my new found green treasure with various pieces from my closet. To my amazement, the cardigan goes well with purple, yellow and blue. I won't go as far as saying that it's my new neutral color but for now, I'm loving it. Outfit: Zadig et Voltaire cardigan, Petit Bateau striped top, Uniqlo jeans and K Jacques sandals. Accessories: Hermes Belt, Hermes Lift GM pendant, Hermes Kelly Dog bracelet (I'm trying to channel the badass rocker chick look) and Hermes clic clac enamel bracelet. 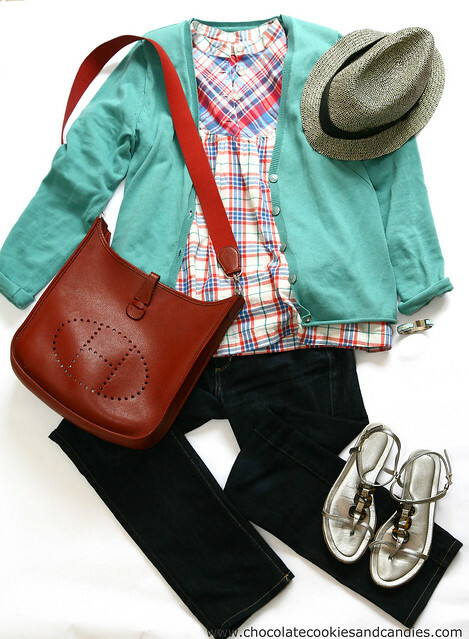 Outfit: Zadig et Voltaire cardigan, A.P.C Madras tunic, Uniqlo jeans and Tod's sandals. Accessories: Jigsaw Trilby hat, Hermes Belt, Hermes Kelly Dog bracelet and Hermes Evelyne Rouge H PM. Outfit: Zadig et Voltaire cardigan, Zadig et Voltaire dress and Tod's sandals. Accessories: Just in Case belt, Hermes cashmere & silk men's losange scarf and Hermes Kelly Dog bracelet. 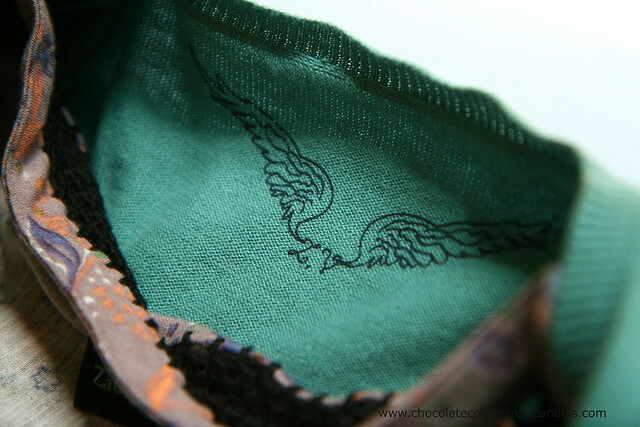 I love these butterfly buttons and wings (bottom). Oh, I wish I hadn't seen this post today. 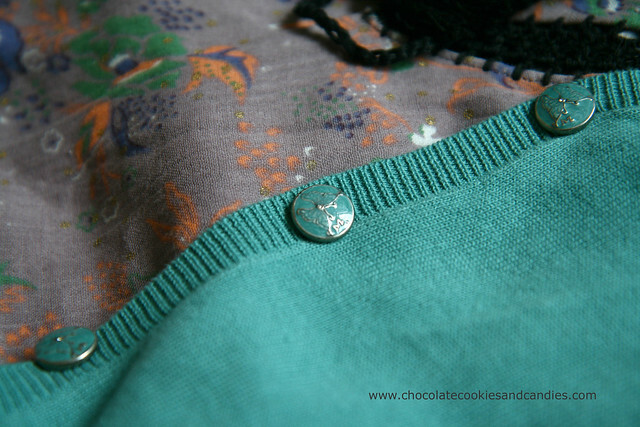 I'm totally in love with that cardigan - LOVE the buttons and little details! It's fun to branch out with color now and again. I must visit that Z&V Chelsea outlet with you when we visit London! I drooled like crazy over the Z&V shop windows in Paris, but after my little Hermes stint, I had to draw the line somewhere and didn't even tempt myself by going in...ugh. i am loving that hermes belt as well! LL, you betcha! I'll definitely take you there. I've seen prices being discounted by 80%. They get a lot of stock every week so it's not difficult to find something you like. Amy, thank you! It's in fact more than 10 years old. Very used and battered but still going strong. Oh my goodness! I am in love with all three of the outfits. I learned a lot by how you put them together. You're so good at the details. Thank you, Natasha. Glad you like the ensembles. I love your blog and have picked up some excellent tips. Oh my... I am infecting you with the missoni-virus and I think you're infecting me with the H-virus, that belt is just divine!!!! The H virus is incredibly infectious. It won't be long before you succumb!